Description: They are 43cm wide (or 45cm outside-to outside) and have zero rise. That's fairly narrow for a city bar which is an advantage in traffic. Reach is about 18cm . The straight grip section is a generous 150mm. 25.4mm clamp area. 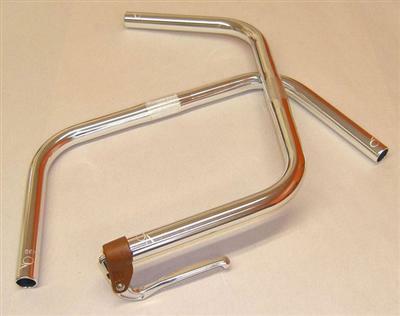 Aluminum alloy.These bars are available in 23.8mm road sized ;clamp area is 25.4mm.◦23.8mm (road-size) bars accept standard inverse brake levers, standard inverse shifters, and 23.8mm city brake levers. In short, anything made for road bars fits. They do not accept MTB levers or shifters.